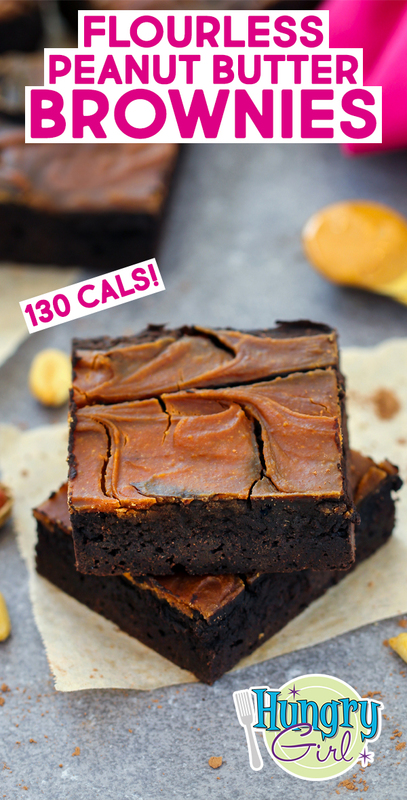 When it comes to brownies, we're all about swapping out heavy ingredients to slash calories. In this recipe, flour gets the boot. Bonus: Peanut butter joins the party! Preheat oven to 350 degrees. Spray an 8” X 8" baking pan with nonstick spray. In a medium-large bowl, mix 3/4 cup powdered peanut butter with cocoa powder, sweetener, and salt. Transfer to the baking pan, and smooth out the top. In a small bowl, mix remaining 1/4 cup powdered peanut butter with 3 tbsp. water until smooth and uniform. Add creamy peanut butter, and stir until uniform. Spoon peanut butter mixture onto brownie batter, and swirl with a knife. Bake until a toothpick or knife inserted into the center comes out mostly clean, 25 - 30 minutes. 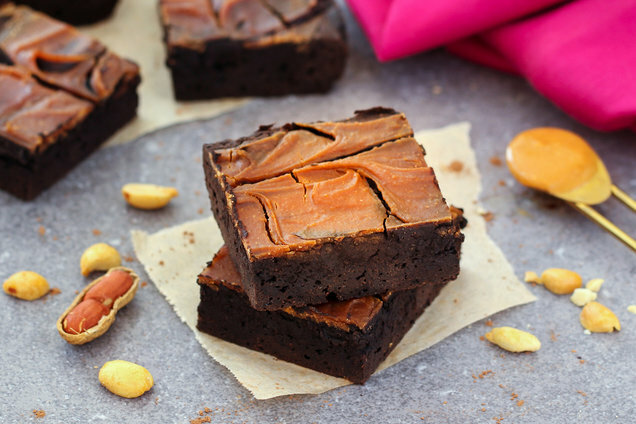 Hungry for More Better-for-You Brownies? She Lost 100lbs. and Kept It Off: 2B Mindset Creator Ilana Muhlstein! In the latest episode of Hungry Girl: Chew the Right Thing!, Lisa goes one-on-one with longtime friend and HG fan Ilana Muhlstein! A registered dietician and the brain behind Beachbody’s 2B Mindset program, Ilana helps people achieve their weight-loss goals. (She’s maintaining a 100-lb. weight loss herself!) Listen in as she shares her story, food philosophy, and so much more. Bonus: She and Lisa share food finds! Did you know that April is National BLT Month? Time for some Best-Ever BLT Wonton Cups! Oh, like your buddies DON'T want brownie recipes? Exactly... Click "Send to a Friend" now.